I love a good hamburger. Who doesn’t? Okay, vegetarians. But I’m not talking about vegetarians here. I’m asking all you meat loving, hamburger eating carnivores! And it is sooo disappointing when you are craving a really good burger and what you wind up eating is just, well, mediocre. 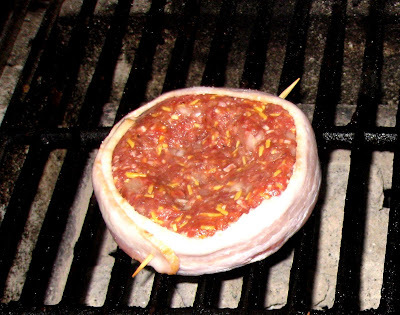 So I found this recipe for bacon wrapped burgers on http://www.allrecipes.com/, my “go-to” recipe site. You’ve heard me sing their praises before. And they didn’t let me down this time either. This is one good burger! Just a few days before we made these, Bob and I had stopped at Smith’s Farm Market and picked up some sweet corn, tomatoes and jalapeños. We had a couple of banana peppers in our deck garden that were ripe and needed to be used, so I tossed together some salsa. I had some really good guacamole in the fridge, too. Bob popped these burgers on the grill and toasted the buns. We piled on the salsa and guacamole and chowed down! With the sweet corn on the side and a few of Bob’s frozen margaritas, well let’s just say that I sure was one happy girl! What a great summer dinner! The only changes, if you can even call them that, were that I used 3 slices bacon and three buns. I only made three burgers because my man doesn’t like chintzy little burgers. No, my man likes man-sized burgers! Whatever. I made 3 burgers from the one pound of meat so I only needed the corresponding number of bacon & buns. Next time you’re making burgers, give these a try. My guess is that you’re going to like them…a lot. 1.Preheat a grill for high heat. 2.In a large bowl, mix together the Cheddar cheese, Parmesan cheese, onion, egg, ketchup, Worcestershire sauce, salt and pepper. Crumble in the ground beef, and mix together by hand. Form into 6 patties and wrap a slice of bacon around each one. Secure bacon with toothpicks. 3.Place patties on the grill, and cook for 5 minutes per side, or until well done. Remove toothpicks before serving on hamburger buns.